Change is afoot for Hammer Metals Ltd (ASX: HMX) now it’s trading under a new ASX code and preparing to resume drilling at its vast holdings in Queensland’s Mt. Isa region. HMX used to be known as Midas Resources Ltd until the board and shareholders recently approved the name change. After a brief period of trading with the ASX code MDSDA, Hammer Metals is now trading under the code HMX. HMX is now preparing to resume exploration work at its 1,950km2 holdings near Mt. Isa. This location in Queensland is a prominent Australian mining region where HMX is developing a number of gold, copper, molybdenum and rhenium deposits. HMX struck a new copper deposit at its Overlander North prospect last year with an inferred resource of 482,000 tonnes at 1.3% copper. A new drilling programme of 2000m of reverse circulation and diamond drilling is set to start at the Overlander resource and any field work there that is outstanding is to be completed. The drill rigs will then shift focus to HMX’s other prospects in the area surrounding the flagship Kalman gold-copper-molybdenum-rhenium deposit. Kalman is a proven JORC resource of 165,000 tonnes of copper, 274,000 ounces of gold, 25,000 tonnes of molybdenum and 2.1M ounces of rhenium, a rare mineral that sells for more than $3M a tonne. HMX is aiming to set up a large polymetal mill in the area with the Kalman resource as its main feeder. The new drilling programme is aimed at finding satellite resources within trucking distance that can feed into the central hub. 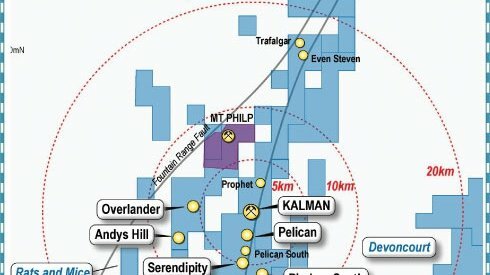 To bring that about the drilling programme will test HMX’s Pelican and Serendipity prospects to the south of Kalman after all the drilling at Overlander is done.